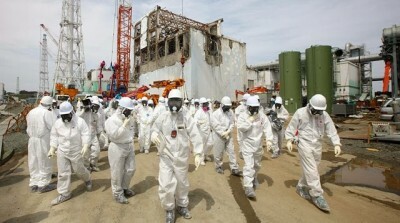 The Telegraph (UK), Mar 26, 2015: Japan may be obsessed with robots, but it is a British company that has solved the “impossible” problem of visualising the radiation leaks inside the crippled reactor buildings at Fukushima — State-of-the-art British imaging technology has been deployed at Japan’s crippled Fukushima nuclear plant to overcome problems that Japanese engineers declared to be insurmountable… [The] system is able to create a real-time, three-dimensional image of the area being surveyed and identify “hot-spots” of radioactivity. 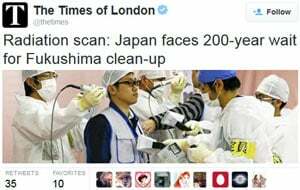 More than four years after… radiation levels within the structures remain too high for humans to enter. That has severely hampered efforts to… clean up the site. Experts have already estimated that process will take three decades but progress to date has been slow. 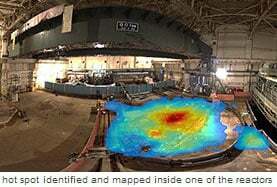 [TEPCO] was only able to confirm on Thursday previous suspicions that nearly all the fuel from the No. 1 reactor at the plant has melted and fallen into the containment vessel. Two more reactors appear to have experienced similar fates… “One of their guys said it was like finding a Picasso in the loft because their experts had told them that what we do was impossible“, [said Dr Matt Mellor, director of Createc]… Createc engineers first visited the Fukushima plant in 2013. “It was a shocking sight… so it was clear this was going to be a major challenge from the outset”, he added.